Status working on an update for windows 10. *I'm reading all comments, but current a little time to answer them all. *priority on the update is win 10 and multi monitors. We can use some testers. The problem is that we can't repeat all reported issue's. sometimes they depend on local settings/hardware. Sometimes people find a way to easy repeat something. Looks like a lot of people reported disconnects. ALso something that needs to be looked at. Do you need virtual machines for testing with different systems, can I prepare? Win 2016 , 10 , 8.1 , 7, 2012R2 ? Thanks for the offer , i have all OS's available as download from MS, some are also offered as a virtual machine. The problem isn't the OS but the network or some domain settings. Using the lab all OS's Always works out of the box, it's just when people install it that the problems start. I'm spending more time on trying to repeat something then actual debugging. I'm downloading this to test tomorrow at work. I have a little remote control app I wrote that pushes the server to a remote PC and then uses the viewer to connect up to 1.2.1.6 it was fine but was disconnecting frequently with 1.2.1.7. Also had the minimize and the viewer crashes bug. We have a fairly large domain with about 1,000 PC's so It'll be a good test I think. Is the ddengine.dll required for 8> like the vnchooks.dll for 7<? or is that optional? 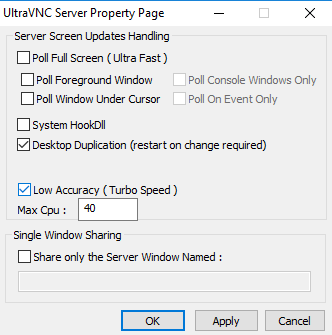 RIght now I push the vncserver.exe and a custom ini file for that, install as a service and connect to the remote PC, I haven't been copying the vnchooks.dll either, seems to work OK.
vnchooks.dll: This give hints about the location of the screen changes. Both are optional: just like your car engine doesn't need a turbo to run. Can you test if the viewer disconnect as often as with 1.2.17, i reverted some changes and all is compiled with an older compiler.It could also be that the ddengine or vnchook make it disconnect..
second bug: new server wasn't working correct without the ddengine, recompiled and uploaded. Was about to post about the black screen every few seconds bug I will test tomorrow at work again and let you know, but I didn't have the minimize the viewer and crash bug nor the disconnect as often when I tested it today. Yes, I am glad you got the black blink resolved. I have the 1.2.2.0 installed on my Windows 7/64 PC. I have installed the 1.2.2.0 version on a few PCs for testing (Windows 7/64, Windows 8.1/64 and Windows 10/64. so both the primary and secondary monitors are active on connecting with the VNCViewer. When I click on the "Select Full Display / Switch Monitor(driver only)" icon, the display shifts to show the remote primary monitor. My VNCViewer window shifts to the right, centering the remote primary monitor display to the center of my monitor, but my VNCViewer window does not resize so the right half of my VNCViewer window is black and the right edge of the window is past the right hand edge of my monitor. I will change the line secondary=1 to secondary=0 and do some more testing. What would you want me to test so I can give you some useful feedback? The capture engine is new. -Is the screen proper updated , no parts missing ? Rudi can you add option to ultravnc.ini run_after_successful_connect=script.cmd or program.exe ? Isn't that a security issue. - winvnc running as service == "system account, with full access"
Sometimes winvnc need to reconnect to follow the active desktop...so several connections are being made. I would suggest to use a program like Sysinternal's (Microsoft's) PsExec.exe to execute a program on the remote PC. That way you can control the security and level of access. For instance you can run as your account, as the system account or as a non-admin user. Rudi De Vos wrote: Isn't that a security issue. maybe only when service is installed, and program/script is only in winvnc.exe folder . After a couple of minutes, it starts showing gray blocks wherever you move the mouse, eventually making the entire screen full until you disconnect and reconnect. This is with the TurboMode=1, PollFullScreen=1, EnableDriver=1, and EnableHook=1 in the server ini file. Trying to test with each one enabled/disabled now for results. EDIT: I did forget to mention that I went into the viewer settings and check the 'Enabled preemptive updates' before this started happening. Feature request: Ability to connect and chat only, then choose to view remote screen if necessary. gray blocks: what's the server OS and encoding ? Recommended viewer settings for LAN (Hextile, CopyRect encoding, etc.). On the server, after stopping the service, I unzipped the March 14 build on top of my "UltraVNC_1_2_17_X64_Setup.exe" install. Launched the new UVNC.exe and started the service from the system tray. Kind of sort of worked. My problem of 1.2.1.7 view crashing every time after being minimized seemed fixed. But screen updates were sluggish. I didn't RTFM. This thread says Windows 10 server should use Desktop Duplication. When it was running, I noticed the Win 10 server was using the Win 7 recommended settings. For Windows 10, I turned off Poll Full Screen and System HookDll. I turned on Desktop Duplication. Rebooted the server. Viewer was unusable. Mostly gray. A few tiles of the server. Requesting a screen refresh didn't fix the problem. I guessed where a window title bar was and started to drag it around. I could see ~80% of the window while it was dragging. Couldn't "see" the start menu, task bar, active/inactive windows, etc. Totally un-usable. I repeated the above with the March 15 build and have the same issue with Desktop Duplication. "Windows 7" server settings (on a Win10 server) is still viewable, but sluggish than it should be (vs. 1.2.1.7 x64 exe install and prior). "Recommended" server settings for Win 10 is unusuable in the same way - mostly gray tiles. Changing the Win 10 x64 server back to the Win 7 server recommended settings makes the viewer usable again (but still sluggish response). I noticed the zip included "ddengine.dll", but my "UltraVNC_1_2_17_X64_Setup.exe" install did not include that file. In the above tests, both builds included the version-appropriate ddengine.dll in the UVNC install folder. If I wasn't supposed to extract that file on a Win 10 server, oops. For fast testing, you can extracted the zip in a temp folder. After reboot or restart the service you are back to the old install. You can have both on, but the idea was to test 2 methods and to enforce one or another. It's always possible that you have a OS >win8 but a video driver that doesn't support wdm 1.2. What's the video card and driver version you have on the server ? Rudi De Vos wrote: It's always possible that you have a OS >win8 but a video driver that doesn't support wdm 1.2. NVIDIA GeForce GTX 650 Ti. dxdiag reports WDDM 2.3. WinHQL certified driver. Win 10 x64 Fall Creators Update (build 1709). wddm 2.3 is > 1.2 so it should work. We are using GTX 1050 to test. This give some kind of endless mirror effect, but exclude network and most security between server/viewer. Working. What was the goal? I un-checked System HookDll per the Windows 10 recommended settings. Desktop Duplication is still checked. Viewer on localhost still shows the mirror effect. The March 15 viewer from a Windows 7 x64 computer shows gray blocks and is unusable. Last edited by andrewk89 on 2018-03-23 01:15, edited 1 time in total. Has the viewer disconnection issue prevalent in v1.2.1.7 been completely resolved? Version 1.2.1.7 was downright unusable. As we could not detect the 1.1.17 issue on our test servers we can't tell if they are solved or not. A 30 second timeout is removed, it didn't existed in the older versions that are reported to work ok. Both wireless on the same LAN. seems super stable. Used the 'server' today for a while with the 'viewer' still connected. Went back to the viewer, which was minimized (1.2.1.7 major issue) and still connected. Do you currently still use the SVN server on sourceforge (https://sourceforge.net/p/ultravnc/code)? Is this beta code available anywhere? Does the server automatically use the vnchooks.dll or ddengine.dll if it sees them in the directory with it or do they require an install or regsvr32 to register the DLL's?